I've had some recent loss in my life, and it has really sparked me to think about time. In general, time has been something that I have learned to value in a big way. I know that it is limited, I know it cannot be regained when it is lost, and we only have a limited supply during this lifetime. Time is so precious. It is precisely because of this that I love photographing and creating audio portraits so much: they serve as creative representations of a particularly remarkable time in one’s life. This can be a joyful time, an anticipatory time, a reflective time, or even an especially emotional time honoring the loss of a loved one. Having these photographs and audio portraits allows those who participate in them (and loved ones who view them) to later enter a visual and audible “portal” to a different time. Hearing voices in conjunction to viewing still images of ourselves and our loved ones (furry and human) provides a powerful platform for a flood of memories to return –memories, perspectives, and thoughts that may have been otherwise forgotten or lost. I recently created an audio portrait with Kate, a high school senior preparing for her graduation. 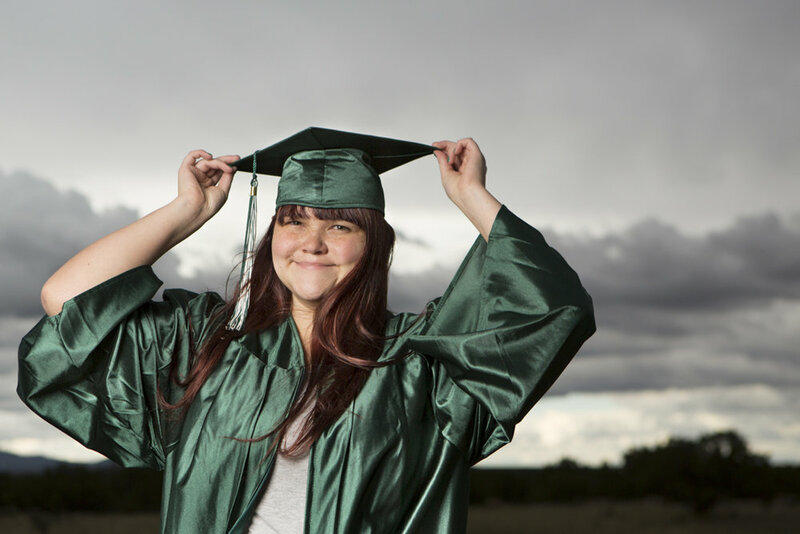 In her audio portrait, Kate reflects on her time and experience in high school, her family, and shares her anticipation of the experiences coming her way after her high school graduation. There are a quite a few aspects seen as particularly sweet about Kate doing this audio portrait. For one, it serves as a time capsule for her – it will be a piece she can reflect upon many years later and listen to her younger self after her years of experience in college and beyond. She can compare her path with the one she maybe thought she’d be on. Creating this piece also gave a platform for Kate to reflect upon her experience in high school and the contribution that her family played in her life thus far. Very heartwarming. From Kate’s parents' perspective, the audio portrait is a piece they can hold close to them as a memory of their child right before she transitions into a new phase – one that enters into adulthood. High school graduation is such a transitional time, and I felt honored to spend some of my time with Kate as she thoughtfully reflected upon her experiences and transition. So, since time is in such limited supply, I love the idea and practice of wrapping it up in a beautiful box of visuals and voices and honoring, most especially, the transitional times we get to experience. Congratulations of all of the high school seniors out there preparing to enter into an exciting new phase of your life!